1 Introduction Maize (Zea mays L) is one of the most important food crops in the world, but the productivity and safety of grain produced by this plant is seriously decreased by a multitude of fungal pathogens causing ear rots. Depending on the growing environment, maize grains can be infected by one or more ear rot fungi, which may decrease grain yield and quality. Many of them also produce secondary metabolites, known as mycotoxins, which can have serious detrimental effects on humans and animals that consume the infected grain. The most commonly occurring ear rot fungi include Aspergillus, Fusarium and Gibberella species, all of which produce one or more mycotoxins (Table 1) and occur over very large geographic regions. Many other fungal species that are not as widespread also infect maize and may produce mycotoxins in the ears (Table 1). Mycotoxin content in maize is highly regulated in many countries of the world, leading to more of an economic than a health problem, as infected grain is destroyed before it can enter the food stream. In some countries, however, regulatory infrastructure is unequal to the task of inspection and enforcement; therefore, much of the infected grain is consumed, often within the household of the farmer who produced it. Immediate symptoms of large doses of mycotoxins may include abdominal pain, vomiting and diarrhoea, and may even lead to death, while long-term exposure to sublethal doses of mycotoxins has been linked to liver and oesophageal cancers, neural tube defects in newborns, stunted growth during childhood and depressed or severely http://dx.doi.org/10.19103/AS.2016.0001.09 ÂŠ Burleigh Dodds Science Publishing Limited, 2016. All rights reserved. ÂŠ Burleigh Dodds Science Publishing Limited, 2016. All rights reserved. to global climate change may exacerbate the problem (Wu et al., 2011). Ear rot fungal spores may travel down the silk channel into the kernel or be introduced into the kernels by insects feeding on the ears. The spores may accumulate in the debris of previous cropping cycles. Thus, there are several potential remedial actions that can be taken to prevent the accumulation of mycotoxins in maize grain. These include crop rotation, tillage of crop residues, modification of planting date, use of biocontrol strains of fungi which do not produce toxins, optimal irrigation and fertilization, control of insects which spread the fungus, application of fungicides, adequate drying following harvest, good post-harvest storage conditions and treatment of infected grains with binders to render mycotoxins harmless. However, the most economically feasible solution for most farmers, and the simplest to implement once the resource is created, is the use of genetically resistant maize varieties. Efforts to reduce mycotoxin accumulation in maize have focused on identifying and selecting natural host resistance factors (Holley et al., 1989; King and Scott 1981; Gendloff et al., 1986). 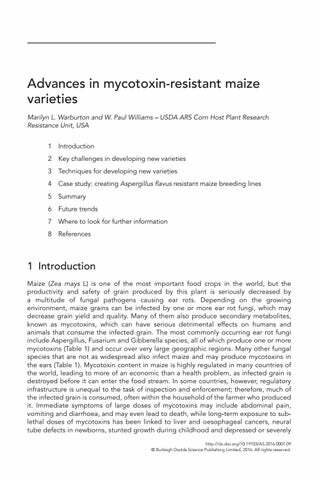 Nonetheless, to date, most commercial hybrid maize varieties still lack sufficient resistance to mycotoxin accumulation (Munkvold, 2003; Abbas et al., 2002), especially in years when environmental conditions favour mycotoxin production (Payne, 1992; Fountain et al., 2015).